Not that I mean to turn this into a Burger Blog but amazing burgers are something which I’ve definitely been pleased to notice are becoming quite an exciting trend in London. 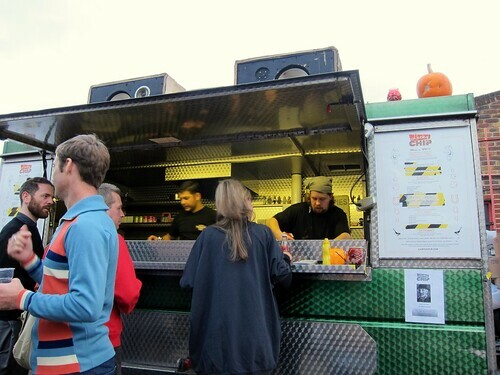 I’ve visited the Lucky Chip burger wagon a couple of times now – but the journey from my house in North London is always a little too far, the wait is always a little too long and someone always seems to be trying to jump ahead of me in queue. The hunger induced grumpiness certainly doesn’t help either! However after one bite of today’s special burger with it’s crispy, deep fried, battered soft shell crab, all crabbiness instantly dissolved, along with the memory of every burger I’ve ever eaten. This was the Bill Murray Life Aquatic Surf ‘n Turf Burger. It took me a couple of attempts to get the film, but there was no struggle getting the burger! There were so many amazing flavours going on; the crispiness of the fresh soft shell crab, the creaminess of the spicy mayo, the saccharine zing of the sweet chilli, the cool guacamole and spring onions and the trademark succulent beef patty blanketed in oozing cheese… it was love at first bite! 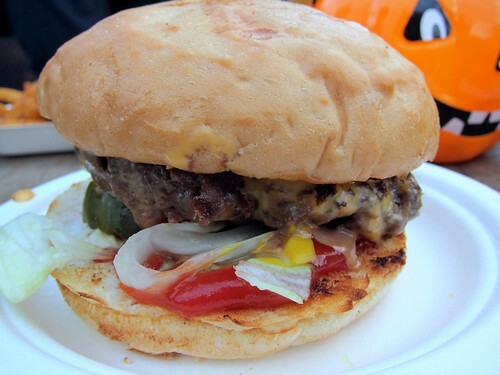 The other burgers at Lucky Chip are also very noteworthy. Simple classics are made with precision and care, resulting in ultimate flavour and juiciness! 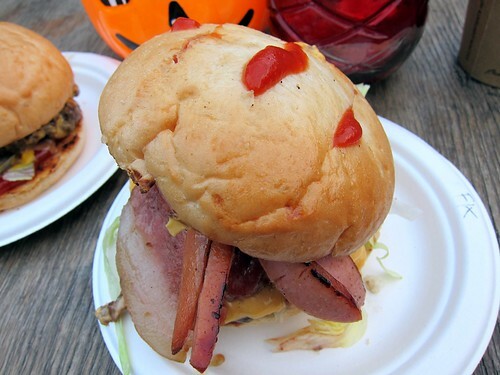 The special on Halloween was a Freddie Kruger Burger with bloody ketchup slashes, and hot dog “fingers”. Fun but more of a novelty than anything else and it was easily overshadowed by the simple but perfectly made cheeseburger. 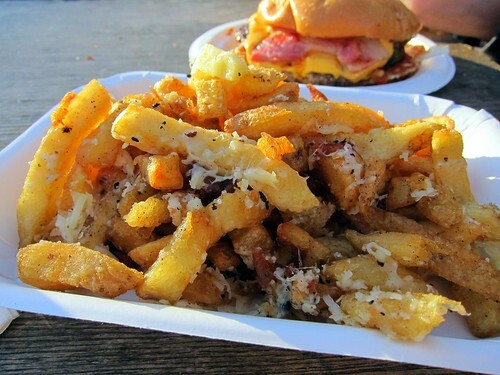 Fries are of the super crispy variety and equally a must served with free optional truffle oil. I felt very lucky get my hands on a Bill Murray Burger on it’s last day before it sold out! Apparently it will be another 9 weeks before it makes another appearance. And next weeks special is tipped to be a Fillet ‘o Fish. I definitely look forward to visiting Lucky Chip again in the future and working my way through the menu. Highly recommended but as with all good things, be prepared to wait. Kêu! It’s a knock out! Indeed! 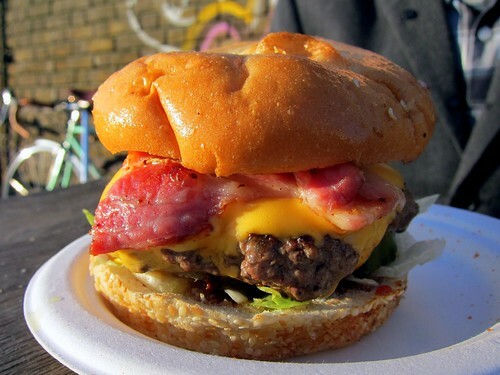 You’ll need to come back and visit and check out all these amazing new London eateries! Cheese fries! Jealous! Don’t think I’ve seen them on a menu here in New Zealand. 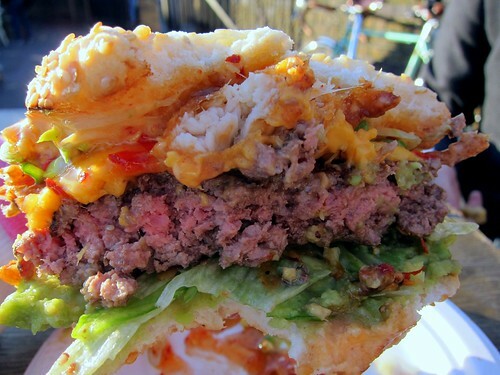 Also, is it really called the Bill Murray Life Aquatic Burger? That is amazing. Come to think of it, I’ve never eaten crab before, either – food envy all round! And cheese fries with truffle oil! Hell yeah! No crab? Definitely something to look forward to – it’s one of my favourite foods! Then again I love pretty much all seafood. Alas I’ve never had much luck with Byron despite all the good things I’ve heard about them. Mine always end up being charred to the point of bitterness on the outside. I love your food photos, especially the first one of the Life Aquatic burger! Any tips for a photography beginner? Thank you! That is very kind of you to say so. I’m really just an amateur myself and happy enough with my point and shoot Canon Powershot S95 and Picasa for enhancing my images. Good luck with your photography! 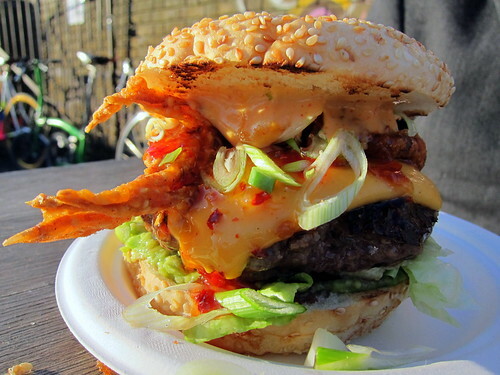 This Catwalk of burgers is craving inducing. Love this post and the rest of the blog! Very kind comments – thanks very much Guan!